An old American variety dating from the late 1800's. 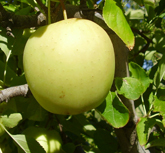 A pale green apple that turns to yellow when ripe, and bright yellow when overripe. Very long stems makes picking difficult. Absolutely delicious when eaten in season, very sweet with light acid. Goldens should not be stored too long as they have a tendency to softness. Has been an industry standard for many years but is now losing market favour.